I think F.J. Richtig from Clarkson Ne. needs to be noted under the old master. 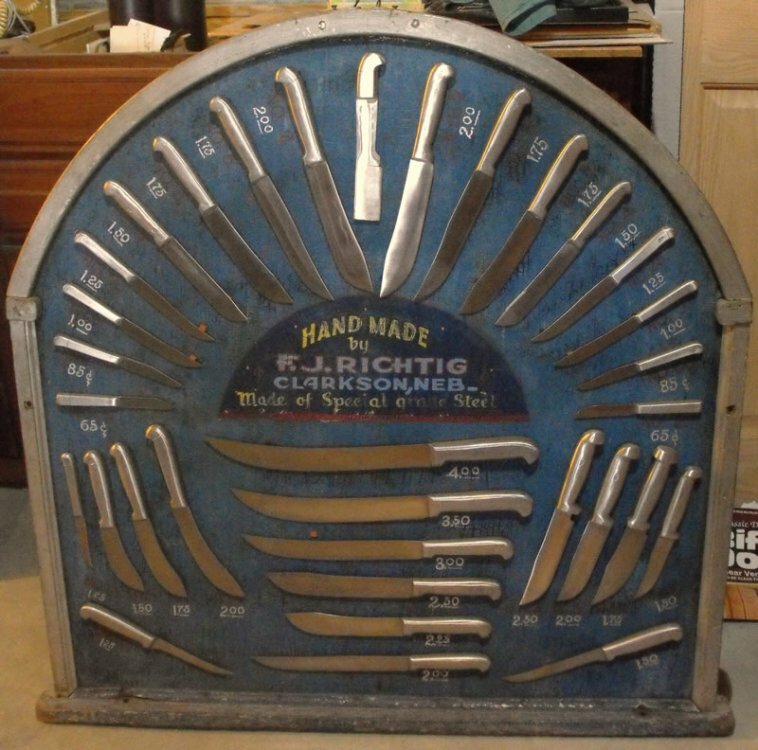 Having made knives from 1927 to 1977. He made his living making and selling his knives for fifty years, during a period when custom makers were few and far between. His main credit would be in his secret tempering method. Where ever he'd set up his wares he'd bring an anvil along and proceed to cut a piece of metal in two and still retain an edge sharp enough to shred paper. One of his other key note features was his cast aluminum handles. Anyone with any thoughts, pictures or comments. Feel free. There was an article in Materials Characterization in 2000 on Richtig knives. I have a copy in front of me now if anyone would like a copy please let me know. Very interesting read. The steel that he used was 1095 heat treated using a austempered according to the article. Other interesting articles are in Knives '84, '88 and '89. There was also a magazine article on Richtig and Nichols released in the early '90s called combat knives. It was like a special issue of Blade magazine. You'll find that most of the articles were written by one of the leading authorities and collectors of Richtig and Nichols knives. A Harlan "Sid" Suedmeier owner of Little Giant Trip hammers in Nebraska City. Richtig's article in Ripley's appeared in 1936. It's also stated that he cut 8800-Lbs of steel over his career. In one article he cut a lock from a jail cell because the deputy had lost the key. Which was displayed for years in his shop. In 1938 he was declare a Master Ironsmith by the National Blacksmith and Welders Association. The thing I think that is interesting is that he was using what I consider a modern H.T. method in and around 1936. Salt baths and lead baths were in use long before. Austempering was a relatively new thing, at least in terms of understanding what and how. Bain did his work at USS in the 30's and 40's. Richtig may not have known about Bain's work, and made the fortuitous discovery on his own. I do not know, and neither does anyone we can ask, so far as I know. You have to watch out for those simple country folk. They can fool you. Very interesting Dave and yes, Richtig should be mentioned here. Sid has shared his collection with me over the years, Richtig was a very prolific maker. Good stuff. I actually own one of his knives. It was given to me by a former teacher I know who found it in his house and thought I would enjoy it more than him. That is one outstanding example of Richtig's work. Could you share the dimensions with us? Blade thickness? Blade length? Sure Id be happy to, measurements are as accurate as I can get them. Those dimensions sound IMPECCABLE, that must be an awesome knife. Like I said before outstanding. You have quite a find there. The info you requested will be in the mail tomorrow. I've attached a picture of the Richtig Display. I paid Sid a visit and he was kind enough to let me photograph it. Hopefully it's not to large for those of you with dial up. i recently found an issue of Knives '84. he was featured in there but, of course, the first page of the article was torn out. no doubt hung on the original owners shop wall as inspiration or used as a reference for a piece of information given. i understand he took his HT method to his grave. its a shame. too bad. You guys keep the history coming, when the history section was started this is exactly the kind of information the forum was looking for. If anyone can scan old articles, pictures, or get new pictures and upload them that would be great. Of course making copies of books that are still in print is a no go because of copy right issues but you can add the name of the book, a picture of the cover a book, basic information and page numbers. I'm living in Belgium and I red about Frank Richtig in a book called Knife Talk written by ....of course ....Ed Fowler (page 75).Read about the test they did! 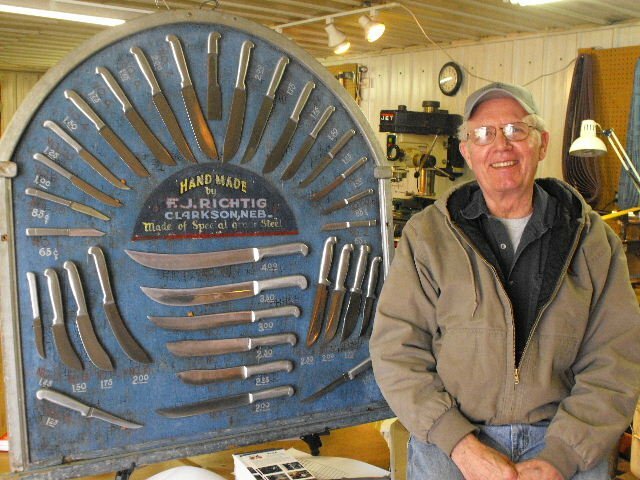 I think it's time to change the title of this article: "The best knifemaker nobody remembers" since some of us will remember him . Somehow this reminds me of(no offence meant) Buck knives since they cut nails in two with the"famous for holding an edge"slogan.(no? )OK maybe not exactly the same but if you can make a knife as good you're on the right track. 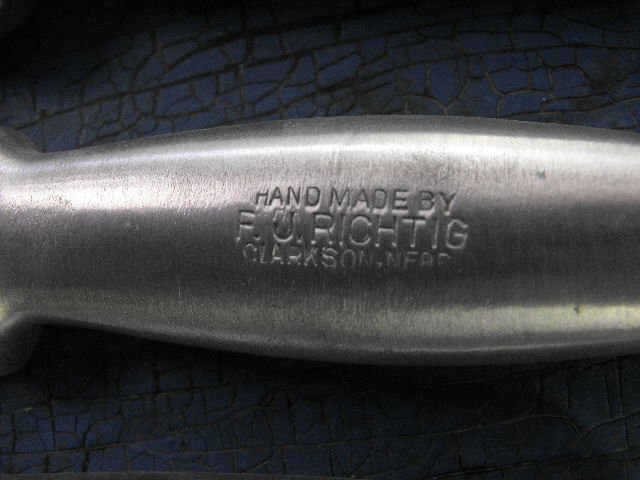 I am new to this forum but have (3) F.J. Richtig knives. Two of them are kitchen/utility knives with the cast aluminum handles that he was known for. 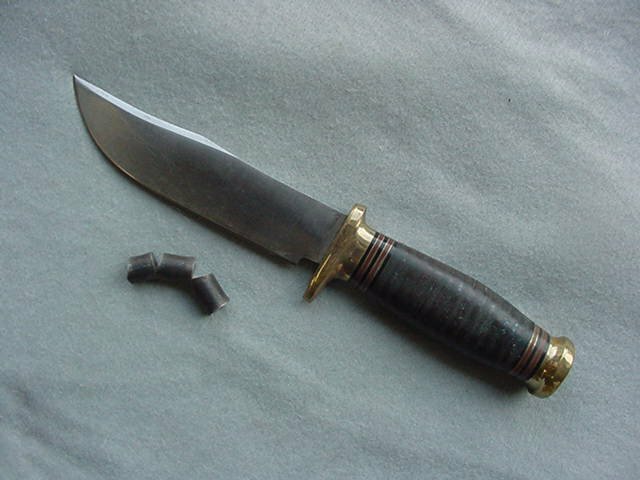 One is a hunter, with leather handle and brass hardware, and it came with the bolt that was cut by it. 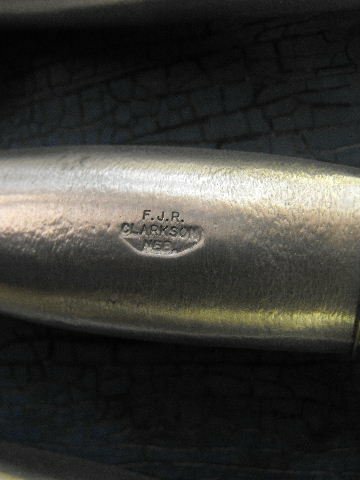 I was fortunate to get this knife before somebody completely polished off the F.J.R. 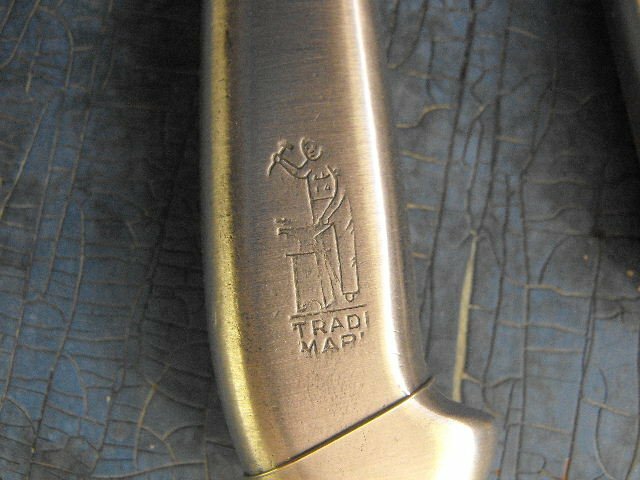 markings on the pommel. I hope my photos post OK.
mikey, looks like a nice blade, could u post more angle of it, specifically the FJR markings and the aluminum blades you have of his? 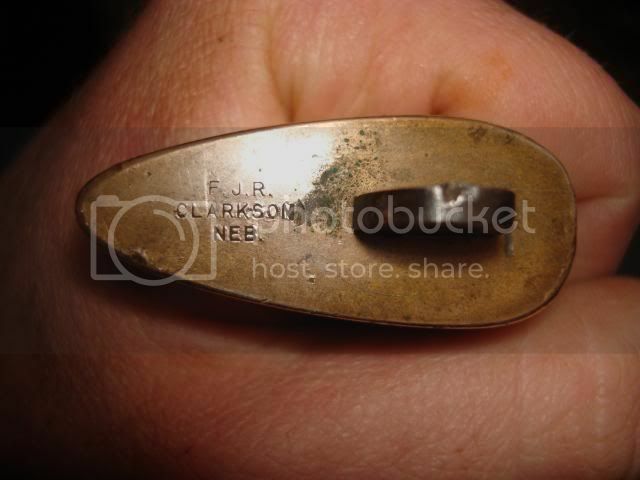 If you are looking for some specific stampings I can get you photo's of all three stamps that Richtig used. Later this year I hope to get some pictures of some of Richtigs more rare pieces. Yes, I was looking to see what stamps he used and any variations they have. Here are photos of the three stamps Richtig used. 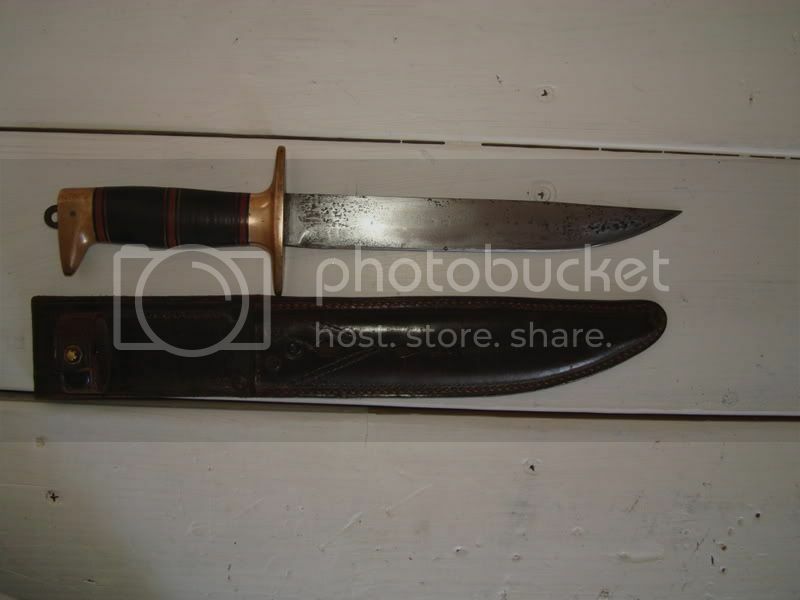 The two large stamps are seen alot together and the small stamp is used a lot on his earlier knives along with most of the leather washer handle ones. The last photo is of Sid the owner of the Richtig Display board. 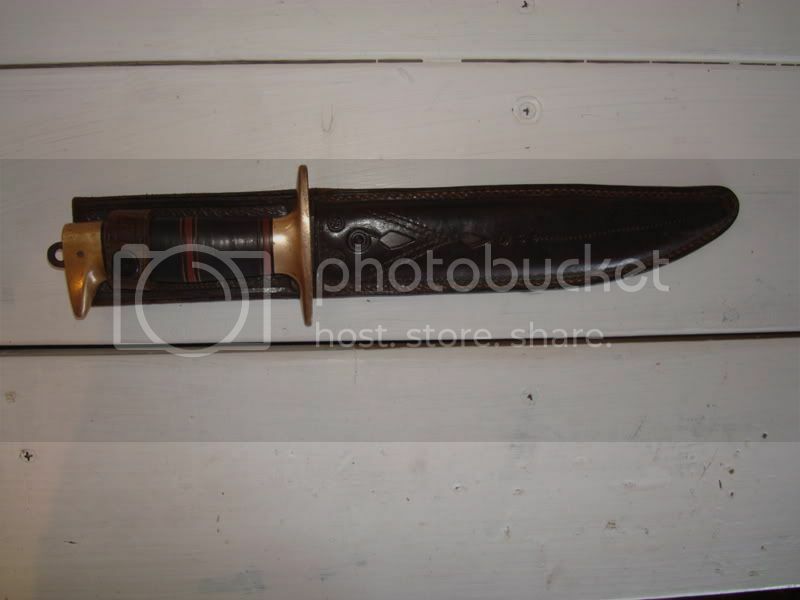 The photos were taken of knives actually on the board.